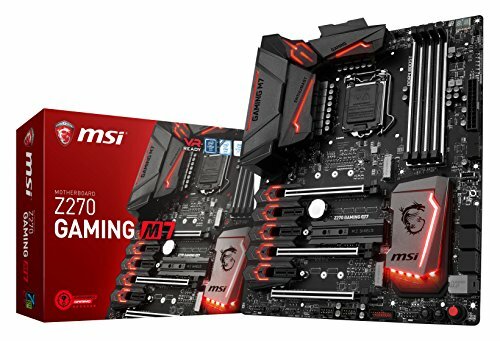 Last but not least we have MSI’s mainstream gaming/performance Z270 product, the Gaming M5. 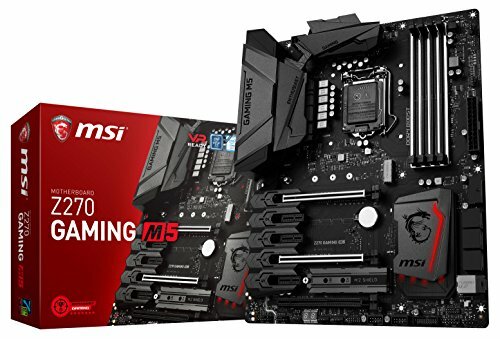 By now we’re starting to see certain trends that all of the motherboard makers have adopted for these boards at this price point, which makes it rather hard to highlight one over the others. As you’ll see, there’s not a lot that is unique with this board, which is also true of the ASRock and Asus boards – they all claim to be doing basically the same things, just better than the rest. MSI has followed Asus’ lead in going for a subtle matte black finish, and then emblazoned it with a gazillion different RGB lights that can show off any colour of the rainbow. It also has MSI’s “Mystic Light Extension”, which is just a fancy way of saying there’s a four-pin header for RGB light strips. In terms of layout, there’s the usual three full-length PCIe slots, along with another three PCIe xl slots. Two of the longer slots have – you guessed it – steel reinforcement, while the third does not. All of the PCIe slots are interconnected by a rather attractive piece of plastic, but we’re a little concerned it might get in the way of some peripherals, although there does appear to be decent clearance around the end of each. The four DDR slots are also reinforced with steel covers, and are rated to handle a top speed of 3800MHz. As for M.2 support, two slots are provided, and one comes with a unique heat-shield. Apparently some M.2 SSDs have heat issues, and this can degrade both performance and lifespan. We’ve never witnessed it ourselves, but at least MSI is doing something different to counter a potential issue. There’s also a single U.2 port if you happen to have one of the very few drives on the market that support this interface. Six SATA III ports are included courtesy of the Z270 chipset; we expected a couple more given the price point of this motherboard. A single USB 3.1 Type C port is included on the rear, alongside five USB 3.0 Type A connectors. However, MSI has used what it calls a feature called VR Boost, which allows both the front and rear USB 3.1 connectors to drive longer USB cords for use in VR applications. Now, again, we’ve never seen issues with this in the past during our extensive hands-on testing with the Vive, but we were using the default cables. MSI claims the use of this USB re-driver will allow for even longer USB cables. 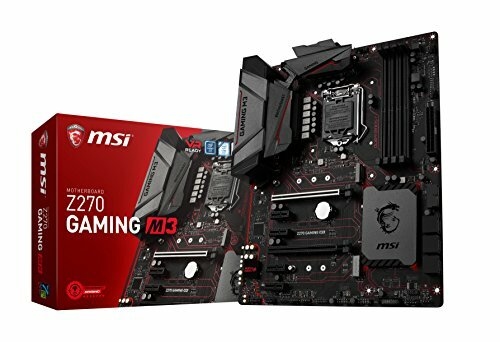 The motherboard also features an ASmedia 2142 USB 3.1 Gen2 controller, which MSI claims delivers faster performance when using multiple USB 3.1 devices simultaneously. This was the only board in the roundup that didn’t feature onboard power and reset buttons, which is a bit of a pain when benchmarking but meaningless when the board is installed inside your case. We’re guessing that this board really isn’t intended for overclockers, as there don’t appear to be many features aimed at them. Software support for one-click overclocking is included, though again this is a feature that is now commonplace. There is a special four-pin connector for water pumps though, delivering 2 amps to more demanding products, as well as a series of onboard LEDs that highlight whether it’s your CPU, memory or graphics card that is causing issues. Restoring BIOS is extremely easy as well, thanks to the BIOS flashback button – just plug in a USB thumb drive with a copy of the BIOS, boot up and hit the button and it’ll automatically reload the BIOS. As for the audio components, you can probably guess by now which chip is in use. Realtek’s latest ALC1220 is used to drive the “Audio Boost 4” sound system, and it’s been enhanced with better capacitors, isolated PCB and all the other goodies we’ve seen employed elsewhere. However, unique to this board is the Nahimic software, which does deliver damn good directional audio. Finally, network connectivity is delivered via a single Killer E2500 Gigabit Ethernet port. 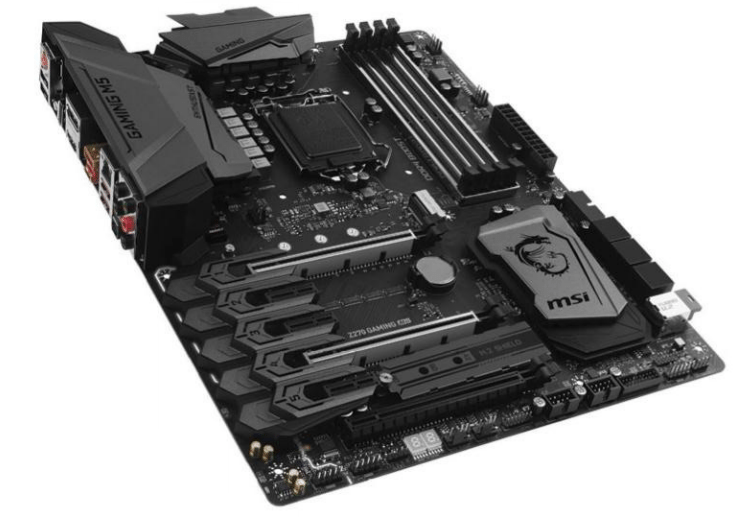 Given that this is based on the Z270 chipset, we expected performance to fall in line with the other boards, and were not surprised when it did so. It basically posted nearly identical results to the other boards, showing once again that the price of a board won’t really affect your frame rates. Picking between this board and the Asus will likely come down to brand loyalty rather than features, as they’re both nearly identical, with each having a couple of unique features that the other doesn’t. 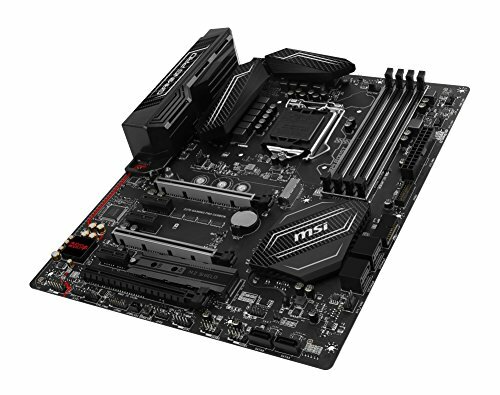 However, MSI has managed to deliver this at a reduced price, which could be spent elsewhere. 24 PCIe lanes; Z270 chipset: DDR4-3800MHZ x 4 slots; Socket 1151: Nahimic 2 Audio Boost 4 sound, w/ Realtek ALC 1220.